For distances of a few inches with high accuracy requirements, "triangulation" sensors measure the location of the spot within the field of view of the detecting element. Time of flight sensors derive range from the time it takes light to travel from the sensor to the target and return. For very long range distance measurements (up to many miles) "time-of-flight" laser rangefinders using pulsed laser beams are used. Modulated Beam Systems use the time light takes to travel to the target and back, but the time for a single round-trip is not measured directly. Instead, the strength of the laser is rapidly varied to produce a signal that changes over time. One method for accurately measuring the distance to targets is through the use of laser triangulation sensors. They are so named because the sensor enclosure, the emitted laser and the reflected laser light form a triangle. The laser beam is projected from the instrument and is reflected from a target surface to a collection lens. This lens is typically located adjacent to the laser emitter. The lens focuses an image of the spot on a linear array camera (CMOS array). The camera views the measurement range from an angle that varies from 45 to 65 degrees at the center of the measurement range, depending on the particular model. The position of the spot image on the pixels of the camera is then processed to determine the distance to the target. The camera integrates the light falling on it, so longer exposure times allow greater sensitivity to weak reflections. The beam is viewed from one side so that the apparent location of the spot changes with the distance to the target. The AR600 triangulation displacement sensor is patented and much can be learned by reading the patent (USPTO 6,624,899). Triangulation devices are ideal for measuring distances of a few inches with high accuracy. Triangulation devices may be built on any scale, but the accuracy falls off rapidly with increasing range. The depth of field (minimum to maximum measurable distance) is typically limited, as triangulation sensors can not measure relative to their baseline, the distance between the emitter and the detector. The exposure and laser power level are typically controlled to optimize the accuracy of the measurements for the signal strength and environmental light level measured. The range data may be internally averaged over multiple exposures prior to transmitting if the sample rate is set appropriately. You can learn more about triangulation at Sensorland.com. Modulated beam systems also use the time light takes to travel to a target and back, but the time for a single round trip is not measured directly. Instead, the strength of the laser is rapidly varied to produce a signal that changes over time. The time delay is indirectly measured by comparing the signal from the laser with the delayed signal returning from the target. One common example of this approach is “phase measurement” in which the laser’s output is typically sinusoidal and the phase of the outgoing signal is compared with that of the reflected light. Phase measurement is limited in accuracy by the frequency of modulation and the ability to resolve the phase difference between the signals. Some modulated beam rangefinders work on a range-to-frequency conversion principle, which offers several advantages over phase measurement. In these cases, laser light reflected from a target is collected by a lens and focused onto a photodiode inside the instrument. The resulting signal is amplified up to a limited level and inverted, and used directly to modulate a laser diode. The light from the laser is collimated and emitted from the center of the front face of the sensor. This configuration forms an oscillator, with the laser switching itself on and off using its own signal. The time that the light takes to travel to the target and return plus the time needed to amplify the signal determines the period of oscillation, or the rate at which the laser is switched on and off. This signal is then divided and timed by an internal clock to obtain a range measurement. The measurement is somewhat nonlinear and dependent on signal strength and temperature, so a calibration process can be performed in the sensor to remove these effects. Modulated beam sensors are typically used in intermediate range applications, for distances from a few inches to several tens of feet on uncooperative targets. With cooperative targets, like reflectors, range can be extended to several hundreds or thousands of feet. Learn more about Acuity's patent on modulated beam time of flight measurement instruments by reading the U.S patent 5,309,212. Acuity's most accurate and most resolute distance sensor employs a unique measuring principle, confocal chromatic sensing. Unlike our time-of-flight and triangulation sensors which use lasers, the CCS Prima Confocal sensors use a white light source to accurately measure the distance to surfaces. Some models are accurate to within 20 nanometers. Additionally, this technology permits measurement and profile of transparent materials like glass, lenses, liquids, etc. 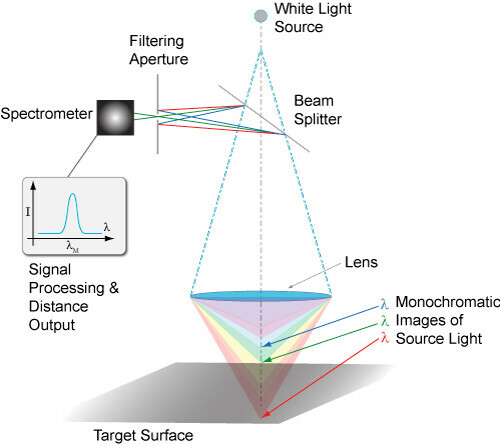 The essence of our confocal chromatic imaging principle is the accurate detection of colors from light that is reflected back from target surfaces. The white light is focused onto the target surface by a multi-lens optical system. These lenses disperse the light into monochromatic stages (colors) along the measurement axis. A specific distance to the target is assigned to each color’s wavelength in a factory calibration. Only the wavelength which is exactly focused on the target is used for the measurement. This light reflected from the target surface is transmitted from the probe, through a confocal aperture and onto a spectrometer which detects and processes the spectral changes and calculates distances. These distance measurements are transmitted at high speed via ethernet communications protocol.